The TaylorMade R11-S fairway wood is the ultimate in fairway wood optimization, with a white non-glare crown and black clubface for easier alignment. It has many of the features of the R11 fairway wood. Adjust the face (+/- 2) degrees with the Adjustable Sole Plate (ASP) Technology. 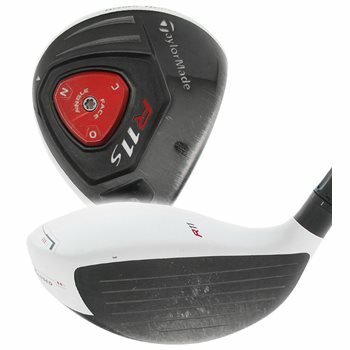 Movable Weight Technology (MWT) allows the player to create either draw-biased or neutral weighting, while Flight Control Technology (FCT) allows the player to adjust the face angle, the lie angle and effective loft by simple shaft/head adjustments with 8 different clubhead positions to choose from. The low and forward CG location promotes faster ball speed and easier launch. The O stands for open and the C stands for closed. By setting it to the O setting, the face will be more open and produce a fade. By setting it to the C setting, the face will be more closed and produce a draw.